"Pastor John Piper thoroughly analyzes the teachings of Bishop N. T. Wright on the topic of justification and sounds a call to discernment for the entire church. N.T. 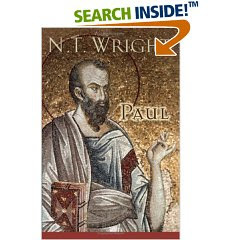 Wright, a world-renowned New Testament scholar and bishop of Durham in the Church of England, has spent years studying the apostle Paul's writings and has offered a "fresh perspective" on Paul's theology. Among his conclusions are that the discussions of justification in much of the history of the church certainly since Augustine got off on the wrong foot, at least in terms of understanding Paul and they have stayed there ever since. Wright s confidence that the church has gotten it wrong for 1,500 years, given his enormous influence, has set off warning bells for Christian leaders such as John Piper, a pastor and New Testament scholar. If Wright s framework for interpreting the New Testament text and his understanding of justification find a home in the church, not only could the doctrine of justification be distorted for generations to come, but the New Testament writers original intent could be silenced. 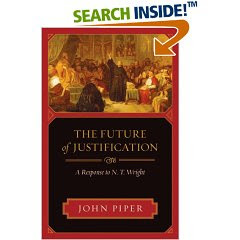 So Piper is sounding a crucial warning in this book, reminding all Christians to exercise great caution regarding fresh interpretations of the Bible and to hold fast to the biblical view of justification." Piper is responding to Wright's book: Paul: In Fresh Perspective. Now, I defiantly expected Wright to get some flack for this one and I should have expected Piper to get in on the discussion. I often agree with Wright, in fact he's probably my favorite living author, but I also have a certain respect for John Piper. If anyone is interested in either of these authors you might want to read both of these books. P.S. My good friend Danny sent me this: Wright on His Critics. It is a short response from Wright on his critics. He talks about Piper near the end. This article comes from Trevin Wax's blog Kingdom People. You might check it out, he's written a lot on Piper's book in the past month. So the Piper book is finally out. I talked with Wright about it while we were in the Bahamas for Soularize. He said that Piper was quite gracious in letting him read the manuscript, and that he [Wright] sent him a 15,000 word rebuttal as to where he felt Piper was incorrect. Two things for everyone to consider. First, the "New Perspective" on Paul, a term coined by James Dunn, is the only vision of Paul's discussions on the Law that is even remotely consistent with Jewish thinking. This vision has been praised by Jewish scholars alike for it's handling of the issues surrounding the law in the Second Temple period. Second, the Amazon description is laughable in that Wright is not chucking out 1,500 years of justification and thus putting the church in "danger." Perhaps it sells books, but it is far from accurate. Wright is calling for a course correction on our thinking of the issues surrounding the law based upon evidence that has been around a lot longer than even the Reformation. He definitely is calling Piper's theology of Paul in to account as it should be. It has it's problems - historically, sociologically, and theologically. I look forward to reading Piper's work - as well as the discussion that should unfold. Perhaps it will be like a version of "theologian smackdown". I agree with you. I think Wright hits the nail on the head... man, I sure would like to read Wright's rebuttal. I stumbled across Ken Schenck's blog, and he is friends with Oropeza, Reeves, and Dr. Wright at our school. I commented on his blog, and he also mentions Dunn as the one who main people who coined this idea of the "new perspective" of Paul. On there he also makes mentions of E.P. Sanders. Sanders wrote a book on Paul too (Wright mentions it within a quote cited by Piper introduction that I sent you). Anyways, it is interesting because Schenck doesn't seem to think that either Wright or Piper has it right, but Dunn is the best scholar on Paul. He's kind of long winded, but he did something similar to Trevin Was by commenting on each chapter. He was really helpful to me, and seems like a stand-up guy. Hope you're having a good break. I will check it out. Now I want to read Dunn.